Adam McLean pictured with his McAdoo Racing Kawasaki on the north coast. The 22-year-old only finished one race in 2018, taking fourth in the first Supertwin event. He was also fortunate to escape injury following a spectacular crash during qualifying after clipping a kerb on the exit of Juniper chicane on his Kawasaki Supertwin. McLean, though, has shown his potential at the North West after clinching a superb fourth place in the Supersport class in 2017. 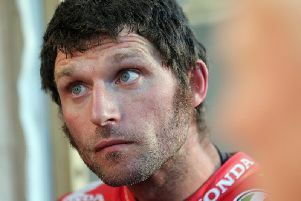 “I only finished one race, taking a fourth place in the first Supertwin event. “I’ve shown I have the pace for some decent results. 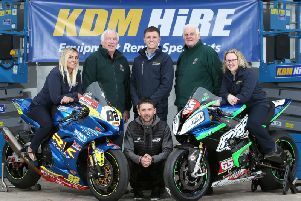 I just need to bring it all together to get some solid results,” added McLean, who was a regular podium challenger at the Irish national road races in 2018 and a Supertwin winner at the Ulster GP. “I’m still learning my way around the ZX10-RR Superbike. At the minute it’s really taking me for a sail! The young Ulster rider was left stunned last year following the tragic death of his McAdoo team-mate, James Cowton, in a crash at the Southern 100 on the Isle of Man. However, McLean decided he would race on and he really came to the fore at the Ulster Grand Prix, sealing a podium in the Supersport race and taking victory in the Supertwin class – his first international road racing victory. “I felt really down after what happened to James,” he said.